In 2015, Bob Dylan said, "I learned lyrics and how to write them from listening to folk songs. And I played them, and I met other people that played them, back when nobody was doing it. Sang nothing but these folk songs, and they gave me the code for everything that's fair game, that everything belongs to everyone." 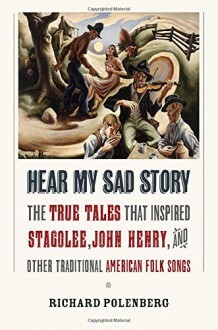 InHear MySad Story, Richard Polenberg describes the historical events that led to the writing of many famous American folk songs that served as touchstones for generations of American musicians, lyricists, and folklorists.Those events, which took place from the early nineteenth to the mid-twentieth centuries, often involved tragic occurrences: murders, sometimes resulting from love affairs gone wrong; desperate acts borne out of poverty and unbearable working conditions; and calamities such as railroad crashes, shipwrecks, and natural disasters. All of Polenberg's account of the songs in the book are grounded in historical fact and illuminate the social history of the times. Reading these tales of sorrow, misfortune, and regret puts us in touch with the dark but terribly familiar side of American history.On Christmas 1895 in St. Louis, an African American man named Lee Shelton, whose nickname was "Stack Lee," shot and killed William Lyons in a dispute over seventy-five cents and a hat. Shelton was sent to prison until 1911, committed another murder upon his release, and died in a prison hospital in 1912. Even during his lifetime, songs were being written about Shelton, and eventually 450 versions of his story would be recorded. As the song-you may know Shelton as Stagolee or Stagger Lee-was shared and adapted, the emotions of the time were preserved, but the fact that the songs described real people, real lives, often fell by the wayside. Polenberg returns us to the men and women who, in song, became legends. The lyrics serve as valuable historical sources, providing important information about what had happened, why, and what it all meant. More important, they reflect the character of American life and the pathos elicited by the musical memory of these common and troubled lives.